When Detective Macy Greeley is called to Wilmington Creek, a sleepy ranching community in northern Montana, she expects an open-and-shut, if high-profile, murder case. What greets her is anything but. John Dalton, a soldier returned home from serving in Afghanistan, has been shot dead in an alleyway outside a local bar. Macy can’t see any obvious motive for the attack, but John’s closest friends and his twin sister, Jessie, have been keeping secrets. With a series of wildfires pushing the area’s resources to the limit and Darby Lake’s water level dropping to a record low, Jessie is becoming increasingly anxious about what may be uncovered if the rains don’t return to the valley soon. Haunted by what’s hidden beneath the still waters, she doesn’t know whether to help or hinder Macy’s investigation. And Macy herself is increasingly uneasy about what she discovers as she navigates the politics of a small town and the Dalton family clan, as well as her own complicated relationship with the father of her young son. In the last decade since I've been reviewing for various publications, it's become much rarer for me to read two books in a row from the same author (due to reviewing, features, festivals, awards judging, reading challenges, and other commitments that all encourage me to read lots of different authors). 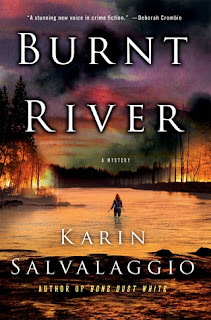 But after reading Karin Salvalaggio's really terrific debut BONE DUST WHITE last week, I couldn't help myself from immediately picking up the second in her Macy Greeley series, BURNT RIVER. And I wasn't disappointed: this book may be even better, and really cements Salvalaggio as a must-read crime writer for me. Great characters that have a real authenticity to them, smooth writing with plenty of subtext and space for the reader to engage and work things out (rather that having them spelled out), a terrific sense of the small-town Montana setting, intriguing spiderwebs of plotlines. Salvalaggio has a strong voice, a great style, and hits it out of the park on many fronts. While BONE DUST WHITE occurred during the snowy chill of the Montana winter, BURNT RIVER is set against a scorching summer where wildfires rage and water levels tumble. Macy Greeley is now a single mother, and relying on her own mother to help care for her baby while she continues to work hard in her career. Her issues with the baby's father remain unresolved and frustratingly complicated, threading through her personal and professional life. The Dalton murder takes her away from her son, and she's determined to quickly dig through the secrets kept by many in John Dalton's circle of family, friends, and townsfolk to uncover who murdered the Army veteran. 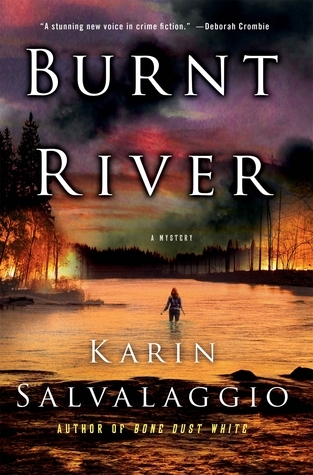 The storyline of BURNT RIVER is great, with plenty of intrigue and surprises along the way. There's multiple strands, depth, and layers. But where Salvalaggio really elevates herself into the upper echelons of crime writers is with her great touch for place and character. I've spent several summers in small-town and rural areas of the United States, and travelled through northern Montana. The Wilmington Creek setting in BURNT RIVER just really 'rang true' for me, vibrantly coming to life off the page in all its mix of community and grit, blue collar jobs and expansive ranches, forest roads and grimy back alleys. The kind of place where most vote red no matter what, but aren't the caricature bigots that those from outside the States might believe. BURNT RIVER has a great 'cast', and whether characters are main players or bit parts, they all come across as distinct, interesting and fully-formed. There's an authenticity to the people who populate Salvalaggio's world; their beliefs and emotions, hopes and despairs, challenges and triumphs all feel real. We can understand and empathise, and follow them through their choices (even the bad ones). Alongside Greeley are plenty of people who'll get varying reactions from readers. John's sister Jessie is a recovering addict and young mother who seems to have turned her life around, but her past actions and long-kept secrets may be putting people at risk. John's friends Tyler and Dylan are both wounded veterans who are variably dealing with the horrors they've seen. Tyler is on leave, heading back for another deployment soon; Dylan is battling with crippling PTSD. Chief Aiden Marsh of the local police welcomes Macy's involvement and help rather than feeling territorial, but may prove a problem for Macy. Meanwhile her boss, State Police Captain Ray Davidson, is keeping a close eye. It's an assortment of lives full of loves and losses, that interconnect and crash into each other in a variety of ways. There are so many layers, but Salvalaggio keeps the pages moving with flowing writing and lots of interesting happenings. BURNT RIVER never feels 'dense' despite its depth. A superb of piece of crime writing that has me thinking of leaping straight into the third Macy Greeley book very soon too. Salvalaggio is has quickly become a must-read author for me, and I certainly hope we'll see much more from her in future (currently there are four books in the series).